In 1977, after the success of his best-selling novel La tia Julia y el escribidor (Aunt Julia and the Scriptwriter, Alfaguara, 2000, reprint), celebrated boom-generation Peruvian author Vargas Llosa began what is now recognized as his tour de force. Based on cataclysmic events in Brazil at the close of the 19th century, this epic historical novel tackles religious, political, and moral ideologies that seem even more relevant in today's rocky post-millennium climate. In Alfaguara's timely new edition of this classic, Vargas Llosa has added a prolog written in 2000. He wastes no time in acknowledging the essential influence of Euclides da Cunha's book Os Sertaos (The Arid Wastelands)Dbased on the 1897 war in Canudos, a small town in the arid northern expanses of Brazil. It was this story, a mixture of fact and fiction, that inspired Vargas Llosa to drop everything and go digging into dusty archives in Rio de Jainero, Salvador, and eventually the flaming hot deserts of the Brazilian state of Bah!a to write this tale about the frailties of mankind in the face of the apocalypse. The story centers around a mysterious, bearded Christ-like man who leads a wretched mass of freaks, prostitutes, beggars, and bandits to create a utopian state. Called the Counselor, he seduces them into rebuilding the decrepit sprawl of the sertaos (arid wastelands) in preparation for the end of the world. The national government in Rio eventually learns of the rebel town and sends in army after army in a chain of bloody confrontations that in many ways reflects the strife that continues to plague South America to the present day. Vargas Llosa started writing this masterpiece in 1977 while at Churchill College in Cambridge, England; then he went on to London and became so absorbed that he pursued the story to its source in Brazil. Finally, in 1980, he returned to the cool, serene library in Washington, D.C.'s Wilson Center to finish the last pages. Vargas Llosa seemed comforted to tie it up there, presumably inspired by how the violence of the Civil War came so close to the capital. In the last line of the prolog, he writes that, while there., ""I was enveloped by flying falcons and in viewing distance of the balcony where Abraham Lincoln spoke to his Union soldiers at the brink of the Battle of Manassas."" This historical novel, based on actual occurrences with plenty of fabulistic legends throughout, is delivered in Vargas Llosa's witty and objective journalistic tone. 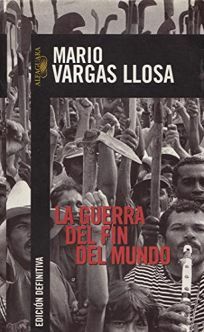 Vargas Llosa, who is so good at bringing to life the human faults of history's fanatics and dictators, succesfully manages to captivate the deranged world of the charismatic Counselor. Adriana Lopez, ""Criticas""